The second round of Heather & Kerri's Pillow Talk Swap is currently wrapping up, and it's quickly becoming one of my favorite swaps on Flickr. 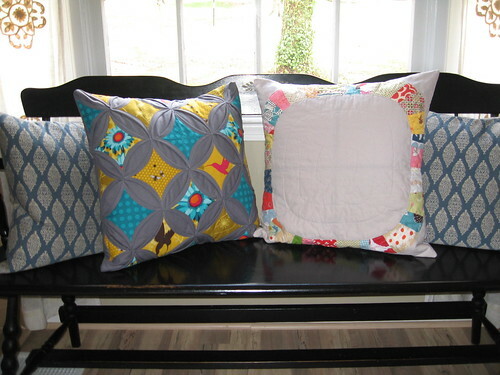 Mini quilts are great, but pillows are just so functional and have already added so much to the decor of my home! Isn't it amazing? I had been watching Heather post the steps of the cathedral windows tutorial that she developed while making this pillow, and had admired it from afar. I mean, solid gray? Flora & Fauna? It's SO me. And then when I realized it was her swap pillow, I wanted it. Like, really, really wanted it. And the weirdest thing? I kind of had a feeling all along that it was coming to me. Here it is alongside my original Pillow Talk Swap pillow, made by Amanda. It's all coming together nicely, eh? 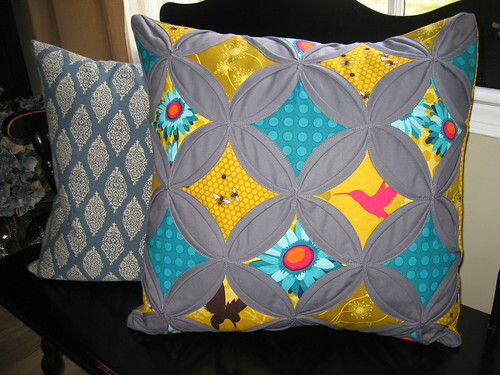 When I first signed up for the swap, I happened to be shopping at my local quilt shop (Wish Upon a Quilt) and they had a sample made up of this exact pillow. It's from Anna Maria Horner's book, Seams to Me. The pattern itself, with it's ruffled take on patchwork, really appealed to me ... but moreso, I couldn't get over how crazy soft it was! I was captivated by the pillow and knew I had to make one. I appreciated being able to try a new technique, since I had never done anything with ruffles before. And I made my own custom insert, since the pillow was not a standard size. I splurged a bit and bought bamboo filling from JoAnn, and I am so glad I did -- it helped my pillow to be as super soft as the one I saw at the shop! This pillow is now safely at home in Hawaii. I hope you enjoy it, Amber! ubber jealous over that cathedral pillow. Oh my gosh, the pillows you received are beautiful... and Amber is so lucky! The pillow you made is gorgeous! Love them. Fantastic work by all! OH. MY. GOSH. I love that cathedral pillow!! Beautiful. Lucky boy! The cathedral windows pillow is fabulous! I saw that tutorial elsewhere and a pillow by someone else in your group using it and considered doing a quilt using grey for the background. It is stunning! umm! you are so lucky to get THAT pillow!!! 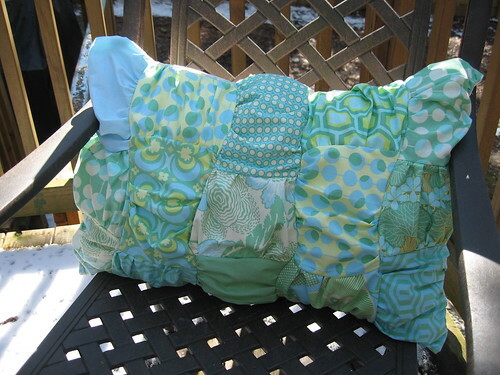 The cathedral window pillow is gorgeous and the ruffle pillow you made is beautiful too. Thanks for inspiring us. Love & blessings from NC! Cathedral window seems to be a popular theme at the moment. Seeing the beautiful pillows on the flickr group has inspired me to have a try at a cathedral window pillow (or cushion as we say here). The cathedral window pillow is GORGEOUS. You lucky guy! Nice swaps. Such pretty pillows. Thanks for sharing. The cathedral window pillow is gorgeous!!! And the one you made is so springy! Lovely! That is a fabulous cathedral windows pillow!!! The cathedral window pillow = greatness! I love it! I LOVE your quilting blog! You wife is a lucky woman. (-: I'm just starting my own quilting blog, as I embark into the world of quilting. Loved your tutorial on wonky log cabins. how awesome do they look together? You totally lucked out!!!! That cathedral pillow is am.az.ing.